Bold borders and backgrounds. 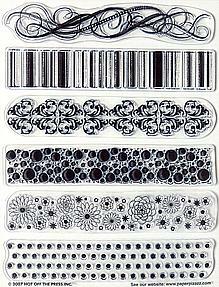 These fresh patterns are perfect for tags, cards, scrapbook pages, mini books and so much more! This versatile collection features 6 different patterns, from a swirl and UPC-style stripe to funky dots and retro-style flowers, plus an elegant scalloped geometric design. And because the stamps are clear acrylic, you can easily line up the design to create longer borders along the side of a background paper, the edge of a photo mat or a card. Designer tips and ideas are included on the back of the package. 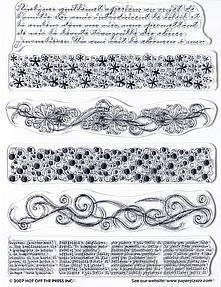 Delicate borders and backgrounds. 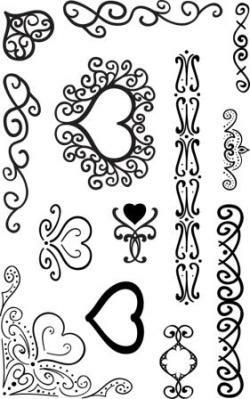 These pretty patterns are perfect for tags, cards, scrapbook pages, mini books and so much more! 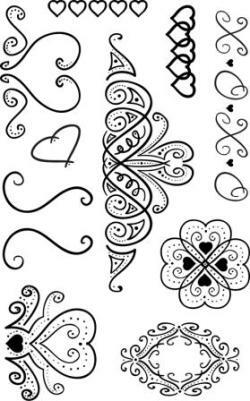 This versatile collection features 6 different patterns, from elegant script and dictionary-style text to hand-drawn swirls, funky flowers and retro dots. And because the stamps are clear acrylic, you can easily line up the design to create longer borders along the side of a background paper, the edge of a photo mat or a card. Designer tips and ideas are included on the back of the package. 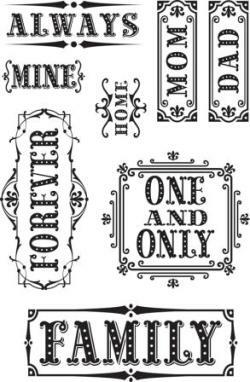 These versatile acrylic stamps are an easy way to add an accent to any papercrating project. They are as fun as they are functional.